Home » Posts Tagged "archive"
Photo by Jean Lewis. A missing transgender archive containing a considerable portion of the community’s historical documents has surfaced after having vanished for seven years. 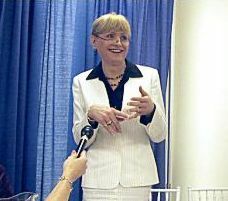 At the recent meeting of The World Professional Association for Transgender Health held in Atlanta in September, sociologist Aaron Devor gave a presentation in which he announced the acquisition of the collection of the Rikki Swin Institute’s extensive holdings by the University of Victoria in British Columbia, Canada. Dr. Devor said an official announcement of the new holdings will be made after the first of the year. In 2000 the newly-formed U.S. 501(c)(3) nonprofit Rikki Swin Institute purchased personal papers of Virginia Prince, Betty Ann Lind, Ariadne Kane, and Merissa Sherrill Lynn. Virginia Prince (1913-2009) was an activist who started a number of organizations for crossdressers and published the landmark magazine Transvestia, which launched in 196o. Betty Ann Lind 1931-1998) was publisher of the magazine Our Sorority and director of Fantasia. Fair. Ariadne Kane (1944-) founded and was executive director of The Outreach Society and was director of Fantasia Fair for many years. Merissa Sherrill Lynn (ca 1936-) was a founder of Boston’s Tiffany Club, Founding Director of the International Foundation for Gender Education, and the first editor of Transgender Tapestry Journal. The Swin Institute also purchased the historical and archival material of IFGE.